One of the most exciting weeks of the year for us at the CSA is watermelon week. It means summer is officially here in fine food form. 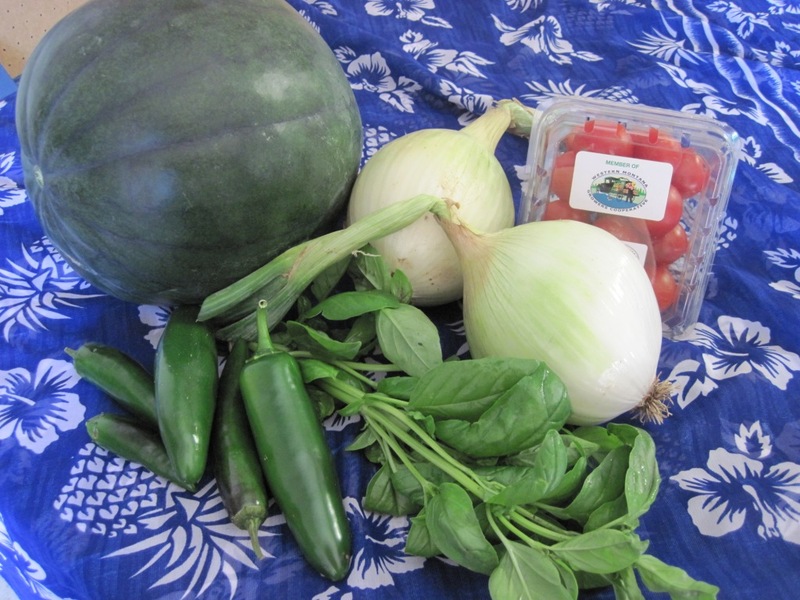 And this is one heck of a share this week to boot: cherry tomatoes, jalapenos, sweet onions, and basil. I think I might have to make salsa! We’ve had a few folks already ask if we are going to offer a fall share again this year. We are! We are going to offer a 6 week share beginning immediately after the summer share, so that will take us up to the week of Thanksgiving (October 20 – November 24). Last year we were able to get pie pumpkins, potatoes, carrots, and other Thanksgiving-y items and we plan to do the same again this year. Of course, it all depends on what’s available, but we usually do pretty good in that department. We’ll start signing people up next week, so bring your checkbooks with you to the pick up! Thanks again for supporting Helena Local and local, seasonal eating!